Tide’s consumer perception has still not recovered several months after the “pod eating” fad sent it to its lowest consumer perception point in at least nine years. But however damaged the brand may be, Tide seems to have an unusual silver lining: the much-talked-about “It’s A Tide Ad” series starring David Harbour, launched at the Super Bowl, appears to be keeping customers buying their detergent. Tide currently has their second highest ad awareness level since the end of August 2016, a mark still very close to what it was after the most recent Super Bowl. Thirty-three percent (33%) of adults 18 and over say they’ve seen a Tide ad in the last 30 days, just one percentage point short of post-Super Bowl levels. Tide has the highest number of current customers it’s had in over a year. Currently, 22% of consumers say they have bought Tide in the last 30 days, one percentage point higher than where it reached after the Super Bowl. 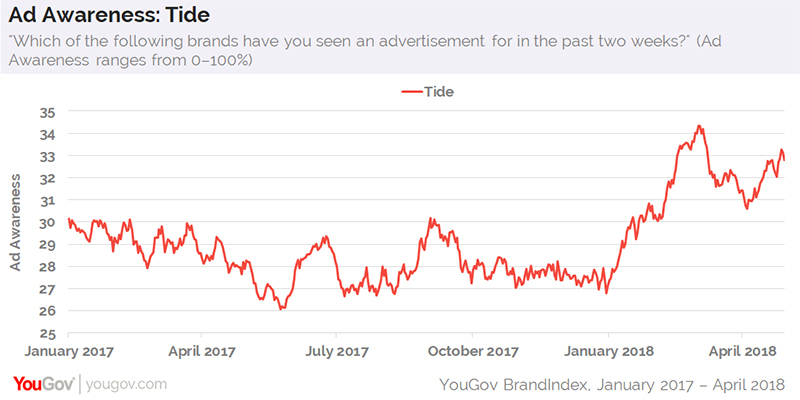 At the same time, Tide’s consumer perception is acting like most brands undergoing a major crises: after falling for nearly three months and hitting bottom on February 20th, perception climbed back up until it hit a ceiling on March 30th, still remaining well short of where it was before the fad took off. So how can a damaged brand still defy logic and attract the most current customers it’s had in 13 months? It’s possible people are so taken by the “It’s A Tide Ad” campaign, which is very atypical for a household detergent, that they are buying Tide in droves. However, consumers are not forgetting the downside: deaths and illnesses resulting from teens taking the Pod Challenge, which is holding back perception from recovery. 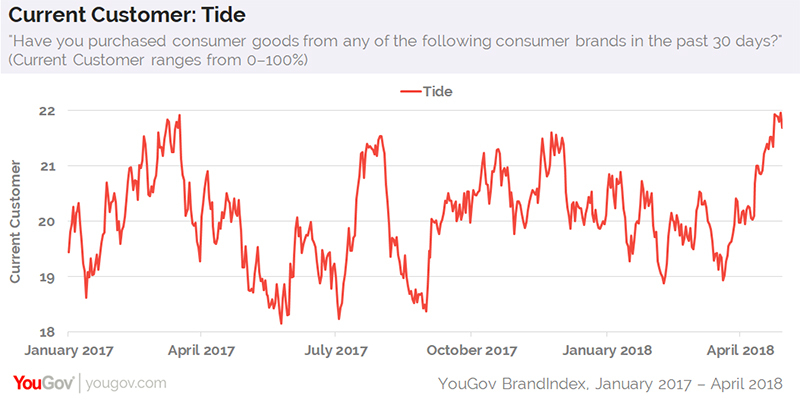 Tide’s consumer perception was measured using YouGov BrandIndex’s Buzz score, which asks respondents: "If you've heard anything about the brand in the last two weeks, through advertising, news or word of mouth, was it positive or negative?